Many people have dental coverage but still don’t go to the dentist. Why? There are many reasons patients don’t make or keep dental appointments, including: lack of time, fear, challenges finding a provider- particularly if the patient is covered by Medicaid, transportation or child care issues, and work schedules. In Thurston County, CHOICE Regional Health Network is working to improve access to care by expanding their care coordination services to include adult pregnant and diabetic patients. This work is part of pilot program approved by the Washington State legislature. Thurston County was selected because of the community’s successful work implementing innovative health care models, like the Access to Baby and Child Dentistry (ABCD) program. Pregnant and diabetic patients between 21 – 64 who are covered by Medicaid will be referred to dental care and receive care coordination support from CHOICE staff. Dentists who are Oral Health Connections (OHC) trained and certified will receive enhanced fees for certain procedures. The OHC pilot launched on January 1, 2019. For the past year, CHOICE has supported over 125 oral health providers in becoming certified to receive these funds. CHOICE care coordination services include scheduling appointments for patients, resolving barriers to attending dental appointments, discussing patient fears and anxiety around oral health, and sharing health education materials. Statewide, the ABCD program has led to a huge increase in access to dental care. CHOICE is eager to translate those best practices to the adult Medicaid population through the Oral Health Connections program. Call Katrin Palmer at 360-539-7576 ext. 103 or email us at abcd@crhn.org for more information and to find out how to get a referral to a dentist. Why Pregnant and Diabetic Patients? • During pregnancy, a bad tooth or gum infection can create serious health problems for mom, and potentially baby too. • Only 40% of women report having their teeth cleaned during pregnancy. • After delivery, moms with tooth decay can pass cavity-causing bacteria to their babies and toddlers by sharing utensils, and cleaning pacifiers in their mouths. If moms have untreated tooth decay it greatly increases the possibility that their babies will get cavities before age two. • Tooth decay is easily preventable and babies with good oral health are more likely to enjoy a lifetime of better oral health. Cavities in baby teeth can spread to adult teeth. Call us at 360-539-7576 ext. 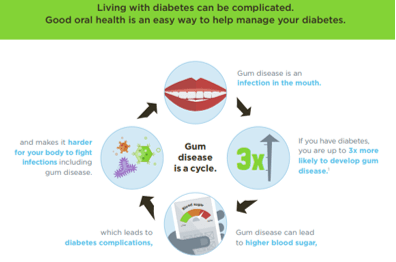 103 or email us at abcd@crhn.org for more information and to find out how to get a referral to a dentist.